Includes : "AT Guide" by David "Awol" Miller, Pocket Profile Elevation Profile Map Set (Complete), Appalachian Impressions 2 Disc DVD Set. The perfect inspirational, planning, and hiking package for anyone dreaming of or planning an Appalachian Trail thru hike. Each set includes a copy of David "Awol" Miller's AT Guide, a complete set of Appalachian Trail Pocket Profile Elevation Profile maps, a copy of Appalachian Impressions 2 disc DVD set. The AT Guide has become hugely popular amongst thru hikers since its publication and is now the go-to guide for AT thru hikers. 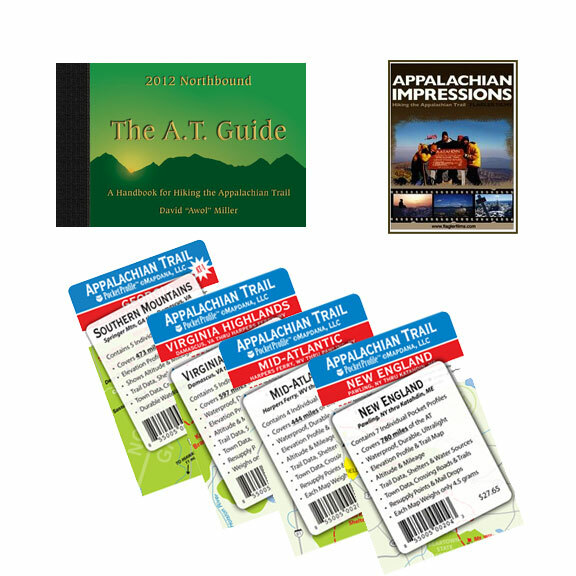 The AT Guide is loaded with useful trail and town data including mileages, landmarks, GPS coordinates, and town resources. It also includes 50 town maps, elevation profiles, and easy to follow icon symbols for many resources like shelters and water sources. Think of the Pocket Profiles as the "Clif Notes" version of the AT Guide. Each profile has a graphic map on one side with icons denoting shelters, campsites, and other major features, and an elevation profile with detailed trail and town data on the other. Each Pocket Profile is printed on water proof and tear resistant material and is printed in full color so you can use them on the trail no matter what the weather and never worry about them getting destroyed just when you need them most. And to inspire you during the winter planning months the 2 disc Appalachian Impressions DVD set is loaded with 126 minutes of breath taking images, stories and real trail experiences that are sure to get you chomping at the bit for spring to arrive so you can hit the trail.